1. Look by M Cotton Leggings in Black I got 2 pairs of these for Christmas & have been living in them lately. They are thicker then a typical legging & are so cozy. These are definitely a winter style staple for me, & it's great that they are chic, comfortable, & warm! If you're on the market for winter leggings I highly recommend these. 2. Essie Nail Color in Ballet Slippers I typically go for darker polish colors, especially in the winter, but Ballet Slippers is a classic & one of my favorite polish colors. It's so clean & instantly makes you look put together. I've been really wanting to use it lately so when I got a pedicure yesterday it was a no brainer. Sometime this weekend I will definitely be painting my nails with this too! 3. Ronzoni Gluten Free Pasta Ronzoni recently came out with this & it is hands down my favorite gluten free pasta. It tastes so much like real pasta, it's crazy, & with quinoa as ingredient there is some hidden protein in it too. 4. Olay Pro-X Advanced Cleansing System I included this in my post the other day & seriously cannot say enough good things about it. It has really helped to improve my skin & I love it! 5. Crayola Washable Glitter Glue With all the crafting I've been doing lately for the new members of our sorority I couldn't survive without my glitter glue (I know I'm being dramatic, but I seriously need this stuff!). If you have any projects coming up this is something you have to get! I adore Essie Ballet Slippers! It's such a pretty color! I love Ballet Slippers too..it's the perfect neutral nail! ahh... I miss the good old days of late night sorority crafting. those would have been the perfect item! I love that Essie nailpolish color! IMO Ronzoni's GF pasta has changed the market of GF pasta. NO one knows the difference & I love that I don't have to make more than 1 pot of pasta for my family! I've been wearing ballet slippers for years, it's my favorite! I love that nail color! It's so cute! I have a similar one that's Hard as Nails and it sparkles a little bit. I wish I could live in leggings! They're so comfy. i'm really interested in this cleaning-system idea, it seems like everyone is using it lately! do you really think it made a difference? I love that Essie polish, so pretty. I need and want those leggings and nail polish!! Oooh, I am torn between the Olay cleaner and the Clarisonic…I've heard great things about both. Thoughts? Those leggings look so comfortable. I need to buy a new pair and the nail polish color is perfect. Essie have some gorgeous nail polishes out there, their shade range is to die for! Such a fun list--love Essie! 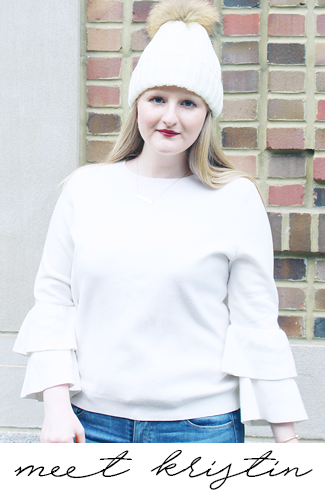 One of my must-haves are warm earmuffs for the winter :) I really enjoy your blog so far and would love to follow each other--please join my GFC and I'll follow you right back!